Discover what makes SmartBlend smart. 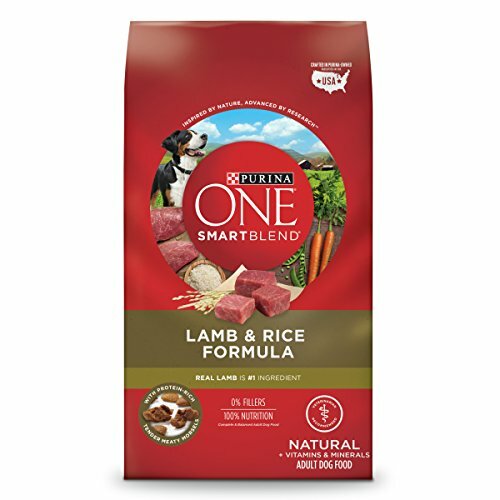 Purina ONE SmartBlend Natural Lamb & Rice Formula adult dry dog food starts with real lamb as the #1 ingredient to help maintain your dog's strong muscles, including a healthy heart. Each meal is highly-digestible and has a combination of protein-rich tender, meaty morsels and crunchy kibble, providing a taste your dog will love to help ensure he gets the complete and balanced nutrition he needs. This food for dogs has a dual-defense antioxidant blend of vitamins E and A and minerals zinc and selenium to help support his strong immune system while promoting healthy dog skin, and natural sources of glucosamine help support healthy joints. Give him a premium dog food variety that he's sure to love, and give yourself the convenience and quality you love. Order Purina ONE SmartBlend Natural Lamb & Rice, which is carefully formulated by Purina dog experts and nutritionists who are committed to delivering a positive impact on your dog's health. If you have any questions about this product by Purina ONE, contact us by completing and submitting the form below. If you are looking for a specif part number, please include it with your message.